On Wednesday, January 18th, CIN-ergy opened the doors of a new office at Orionweg 30 in Leeuwarden, the capital of Dutch province Friesland. CIN-ergy is the R&D engineering and production department of CINOPTICS. CINOPTICS aims to strenghten its brand awareness in the region and offered their guests an opportunity to watch demonstrations of some of CINOPTICS end products, such as the ARGON Simulated Virtual Binocular, IRIS Virtual Microscope, AIRO II Head Mounted Display and ARCTIC Handheld AR Viewer. Recently, Cinoptics’ technology and products have received media attention in the Netherlands. Follow the links to read the articles in Dutch regional newspapers “Leeuwarder Courant” and “De Limburger“. 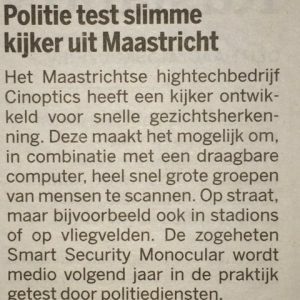 Also a new project has been revealed: in 2017, Dutch police forces will test a new device for facial recognicion, currently under development by Cinoptics.